Bao Ji Wan (Bao Ji Pian, 保济丸 or variously called as Po Chai Pills, Curing Pills, Kang Ning Wan), is a household traditional Chinese medicine for quick help on acute onset stomach discomforts, whether it is due to travel, cold, overeating, or hangover.† The Chinese herb is one of the few Chinese medicines strongly recommended to take along with wherever you go. Bao Ji Wan was originated a century ago in Southern China where the weather is hot and humid especially during the summer and people are used to drink cooling herbal teas to clear the heat and assist digestion. The Herbal formula was said given by a Buddhist monk to someone (Mr. Li) who often offered free herbal tea to him and others. The name of the Chinese herbal tea is thus derived to indicate "help the public" in Chinese. Stomach discomforts also occur often during travels. For one, motion sickness may come along with nausea, throw-up, and loss of appetite. One eats unfamiliar food at irregular hours which may upset the stomach with diarrhea, indigestion etc. Bao Ji Wan (Pian) contains a set of Chinese herbs that take care of gastrointestinal disorders and promote digestion. For example, Cang Zhu (Atractylodes) strengthens the Spleen and dries Dampness; Hou Pu (Magnolia bark) moves Qi energy and removes food stagnation; Ju Hong (Tangerine peel) strengthens the stomach and aids digestion; Mu Xiang (Aucklandia) moves Qi energy, relieves pain and harmonizes the stomach; Fu Ling (Hoelin mushroom) and Yi Yi Ren (Job's tears seeds) strengthen the Spleen and eliminate dampness by promoting urination; Shen Qu (Medicated leaven) and Gu Ya (Rice sprout) dissolve food stagnation. Bao Ji Wan (Pian)/Po Chai Pills is good for use in summer colds with gastrointestinal symptoms.† In addition to the above Chinese herbs that address the gastrointestinal problem, the herbal formula has Chinese herbs that help relieve cold symptoms such as chill, fever, and headache. In this aspect, Huo Xiang (Agastache) transforms Dampness, stops vomiting, and disperses Wind-Cold; Bai Zhi (Angelicae Dahuricae) disperses Wind and relieves the exterior symptoms like headache; Bo He (Mint) disperses Wind Heat; Ge Gen (Kudzu root) relaxes muscles and clears heat; Tian Hua Fen (Trichosanthes) clears heat and generates body fluids. 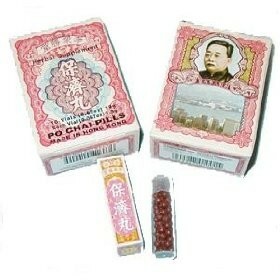 The property of Bao Ji Wan (Pian)/Curing Pills also makes it a choice of Chinese medicine for hangover. It may fasten the clearance of the impact under alcohol and restore the normal functions.